Manual Osteopathy And What Can It Do For You! Laser Therapy for Pain in Calgary. Alberta Laser Rehabilitation Centre is proud to announce the additional practice of Manual Osteopathy that we combine with Laser Therapy to help YOU get rid of your pain. 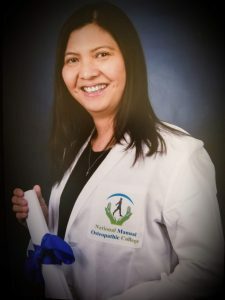 Congratulations, to our very own, Amphy Calma who received her Diploma in Manual Osteopathy with honours and distinction. Manual Osteopathy use a variety of techniques to address imbalances in the body, from a whole body perspective. This includes treating muscles, bones, joints and fascia through the soft tissues of the body to achieve and maintain structural balance and health. Osteopathic manual therapists believe that abnormal functioning of one area of the body can cause symptoms to present elsewhere in the body, the theory of “Tensegrity”. When the body is balanced there is no excessive stress anywhere in the body, but when the body becomes out of balance this can be amplified to other areas. Osteopathic manual therapists regard the whole of the body as greater than a collection of all its parts. They acknowledge the body’s inherent ability to heal itself and seek to support that process by removing any obstacles that impede it. In order for this to happen osteopathic manual therapists specialize in individualized patients management, which includes educating the patient about their particular condition and how they can adjust their lifestyle to allow themselves the best possible chance recovery or optimal management. Manual osteopaths use visceral manipulation to treat organs and viscera of the body, including the liver, spleen, kidneys, stomach, pancreas, intestines, bladder and uterus. Patients may feel pain in one or more of these organs, or the viscera may be less pliable than it should be. Manual osteopaths gently move the structures themselves and the fascia (connective tissue) that surrounds them to restore full movement.Most patients treated with visceral manipulation feel only the gentle pressure of the manual osteopath’s hand, but the corrections are powerful enough to improve the mobility of an organ, improve blood flow, and help the organ function more effectively. Manual Osteopaths use this technique to reduce muscle spasms near a joint, ease neurological irritations around a joint, make joints more mobile and to reduce pain and discomfort. The osteoarticular technique involves gently moving 2 joint surfaces. Before doing this, manual osteopaths carefully prepare the soft tissues around the treatment area. They also move the patient into a position that will minimize, or eliminate the energy and force needed to perform the maneuver. Many patients find this technique less forceful than joint manipulations. The practitioner uses advanced fascia release in many different ways. In general, they use it to evaluate the condition of tissues and to help the body’s fluids (such as blood and lymphatic fluid) flow smoothly. Keeping fluids flowing smoothly reduces harmful fluid retention and makes the body’s immune system more effective. Fascia is tissue found in all parts of the body. It connects all of the body’s structures at both superficial and deep levels. Practitioners evaluate the fascia to find areas of restriction, and then use soft tissue manipulation to make sure the length and tension of the fascia are properly balanced. Throughout the treatment, manual osteopaths keep checking on the state of the body’s tissues. If one technique isn’t working to correct a restriction, they use another approach instead. Above all, manual osteopaths try to restore health without over-treating. CLICK HERE To Book Your Assessment!!! UK BEAM Trial Team. UK back pain exercise and manipulation (UK BEAM) trial—national randomised trial of physical treatments for back pain in primary care: objectives, design and intervention. BMC Health Serv Res 2003;3: 16. A. Lanas, et al. ‘A nationwide study of mortality associated with hospital admission due to severe gastrointestinal events and those associated with nonsteroidal anti-inflammatory drug use.’ Am J Gastroenterology. 100(8) (2005), pp.1685-93. SPRING IS HERE!!! 8 OUTDOOR ACTIVITIES WE RECOMMEND! I must come and visit you for your new treatment. I do have a sore shoulder and wonder if it is rotator cuff, heartburn and who knows what else? I come back from Phoenix on Dec. 13th for two weeks. 14th, 17th, 18th a.m., 20th , 21st, all look good if you have time? Thank you Connie! Looking forward to help you. Take care!